A day off for Good Friday allows me to write a bit about my current experience as a student teacher this spring. Some background first. My last step in my Masters program is a full-time field experience working in a teacher’s classroom for almost 4 months. I started with observing my teacher’s classes and slowly started taking over lessons. For the past 3 weeks I have taught 3 of his 5 periods. In a few weeks I will take over all 5 and teach them for the final month. I get officially observed by a professor from my university this time and am filling out a excruciatingly thorough form for the state providing “evidence” that I know what I am doing. Baring any set backs, I am due to graduate with my Masters and teaching license on May 18th. Pretty exciting. First thought. No matter how much time you spend in a classroom, the first time you teach to a new group of students is nerve-wracking. The first lesson I taught a couple months ago went fine but regardless, 15 minutes in I realized my plan was not as good as I had hoped and I could not stop sweating. In February. Things have gone smoothly since but this reiterates my second point. Teaching, even when it isn’t hard is never simple or easy. Now I do not want to be that guy who waxes on and on about how hard teachers work and how selfless we are and how big my future pension will be because I deserve it. But I am working. Granted my official “work day” is under 7 hours but as I have taught more I have watched my desk grow in piles of paper and attempted (and failed) organization schemes. How many piles do I need before I reach paper-usage nirvana? In any case here is my point. I don’t have the luxury of posting status updates about how I wish it was Friday already. I cannot zone out for 15 minutes because the lesson plan I created is boring even me. I am in front of skeptical young person who are complicated, diverse, disengaged and distracted. When I stand up in the front of class I have to perform and my performance better have some substance because they will call me out (mentally or otherwise) if I do not. Genuine teaching is the real deal and we should not let politicians or friends or society say otherwise. Finally, things are going really well. I am pretty busy. I am trying to lesson plan, test create, grade work and get to know kids everyday. The “get to know kids” part is by far the best and being in a classroom everyday is a pretty fun experience. They can be funny and entertaining and sometimes even annoying and petty but bottom-line working with young people is totally worth it. I look forward to having my own classroom hopefully in the fall. Let the ridiculous craziness of this career begin and begin soon. I have a snow day off from student-teaching today. I have glorious plans to relax and catch up on lesson plans and job applications. In reality I am busting up my twitter feed and getting inspired to write blog entries after checking out Facebook for too long. So I lived in South Africa for a year. The place I lived is no longer owned by the organization I was with because that organization no longer exists (long story). The place I lived was an incredibly beautiful game reserve turned mission base. 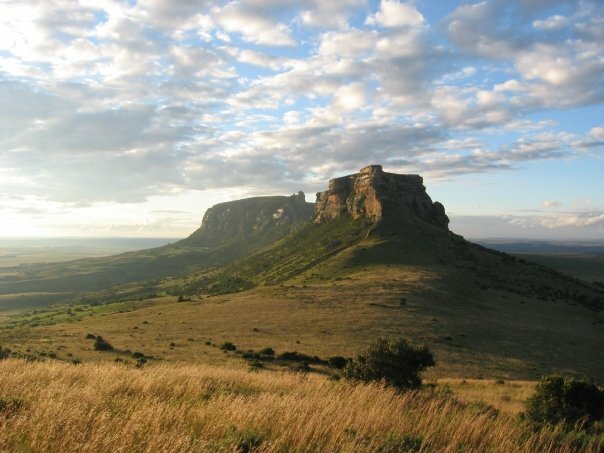 Three mountains, hundreds of acres and various South Africa animals including blesbok, zebras, ostriches and wildebeest. The hotel style room I shared with two roommates was literally on the side of the mountain you see in the picture above. Simply gorgeous. An American pastor I met when I was living there is back for a visit and photos were posted on Facebook of him in front of the very rooms where I lived. Looking at the photos memories came flooding back of how awesome living in such a uniquely beautiful place was. I remember morning runs, the sun just peeking over the horizon far to the East, as I disturbed groups of wildebeest as I ambled along the trails. I remember hikes to remote parts of the property to think, take pictures and simply let the landscape envelop me. I remember running up the mountain above in order to train for a local race, getting to the top, vomiting in front of some friends, than ambling delicately back down. I am not likely to live in such a spectacular place again. But on a cold snowy day in New England I am thankful to take a moment to look back and remember the memories, the people, and the place where I lived.